We asked four young designers to tell us about their experiences at the four major undergraduate design programs in the state: Hartford Art School University of Hartford, University of Connecticut, Central Connecticut State University and SASD University of Bridgeport. Mark Snyder was always there for me, helping you get where you need to go; Deb Kline was a hardass who wants to see you succeed — in the best way; Natacha Poggio was very involved outside of the actual classroom, and Kevin Sepe will get you out of any jam — no matter what it is. And there are more who have been involved at different points in the years, they have all been a great inspiration. The most valuable experience I had at UConn was the opportunity to work at Design Center for three semesters. With direction from Edvin Yegir, my classmates and I worked with clients from on- and off-campus. We created campaigns, brochures, catalogs, identities and websites. I think the experience of managing projects, meeting with clients, and creating and collaborating is something that can only be taught in a studio environment. Essentially, Design Center is a design studio. The only difference from any other studio is students create the work. We never left the lab… It is a wonderful feeling when you come back to do work and you see more than half of your class working hard after hours to make the best project they can. 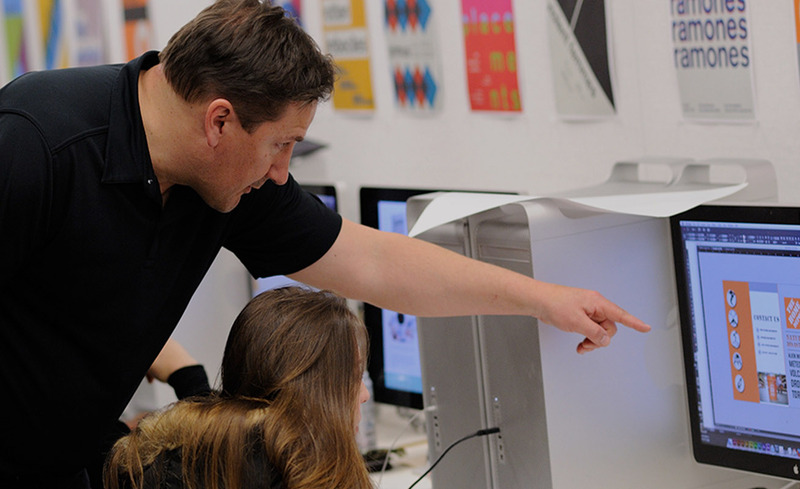 Before you can even get full acceptance to the Graphic/Information Design program at Central Connecticut State University, you have to take a class where you learn the basics of design. The catch is you are only allowed to use Microsoft Office programs as your “creative software” for your assignments, so it puts everyone on an even playing field as far as experience with software. It lets the student’s creative problem solving shine through. A class that really helped was Design Service. They started offering it when I was a junior, and it’s a good thing they did! Design Service is a student-run design team under the instruction of Emily Larned. So what happened here was basically, we’d have a client meeting, take notes, ask questions and whatnot. Then once they left, we’d have a meeting of our own, brainstorm, and start working on the project. It was really quite helpful and pretty much as real world as you can get while still enrolled in school. Emily was the big job e-mailer. As soon as she’d hear of a job she’d either post it on her blog, or send us an e-mail. The variety of classes offered is amazing. I think what our school has that distinguishes us from other schools is our strong emphasis on typography. It’s always great to know how to make some awesome effects in Photoshop, but what we learned about type from Gary is really something else. And I see how that’s coming in handy now. When I’m designing at work, half the time it’s something computerized, but nothing compares to a clean beautiful typographic design. We really learned how to appreciate it and use it correctly.